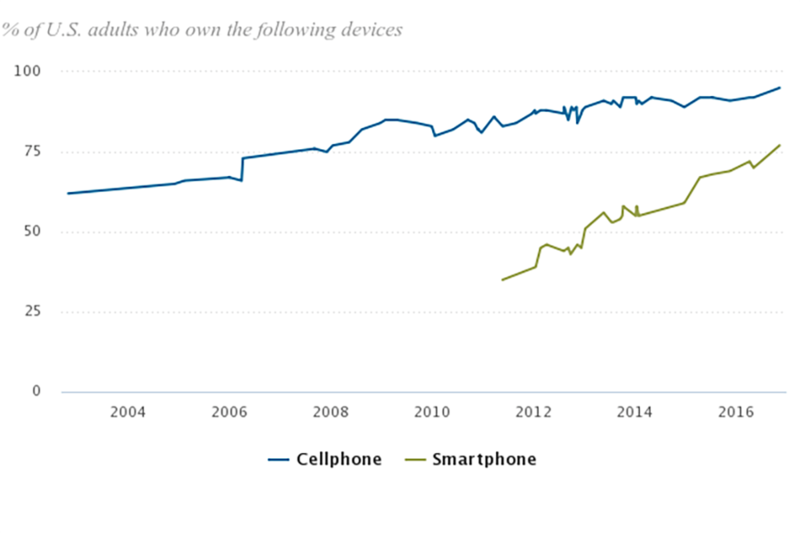 Smartphone penetration in the UK is at 81%, up from 52% in 2012. In business you are told to “know your customer”, and this extends to understanding their behaviour. So if they are using their smartphones as their main device, shouldn’t you be on it? Making it easier for them to engage with you? The benefits of building your own mobile app for your restaurant far outweigh any perceived disadvantages. 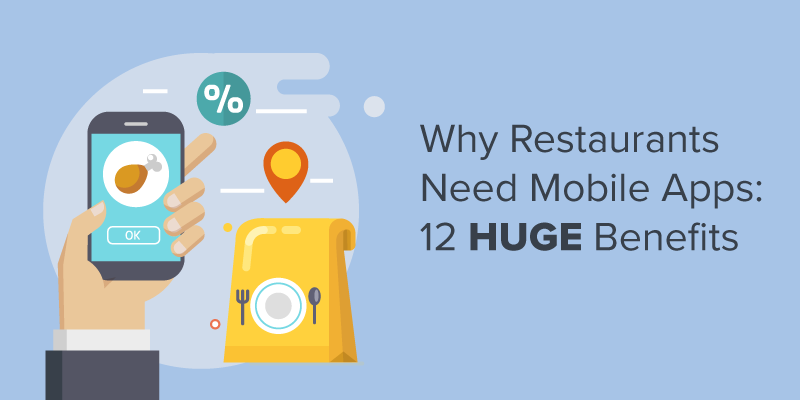 And in this article, we will look at 12 ways a mobile app can increase business in your restaurant. One of the simplest KPIs for any restaurant is the number of customers served each day. It is a good indicator of popularity, and – when used to calculate total sales per head – a good measure for growth. Bookings are a sometimes contentious issue, with any restaurant that accepts bookings also having to deal with the problem of “no shows”. But besides being a staple of the restaurant industry, for out-of-the-way restaurants, they are often the only indicator of a busy mealtime. At the same time, bookings are a bit of a pain for everyone involved. For customers, there’s first waiting for someone to answer your call, then trying to see when they can actually accommodate you, followed by having to spell your name and surname a dozen times, before giving up and hoping for the best. For restaurant owners it begins with ensuring you have someone available to answer calls – as infrequent as they may be at times. This person should not only know how to manage bookings, including getting all the relevant personal information, but also when to call to confirm a booking, and managing the wait list. Despite the growth in the number of smartphone users around the world, people are making fewer phone calls. Between 2013 and 2106, the number of people not making any voice calls in a given week increased from 4% to more than 30%. Now if you’ve already switched to online booking via your website, you would know how much more convenient it is for you and your customers. And while the online booking feature of a mobile app is not that different to on your website, it does offer one unique benefit – push notifications. You can use push notifications to confirm online bookings, instead of getting someone to call each customer. Use the push notification to not only remind them of their booking, but also to ask them to cancel the booking if they can no longer make it. If your online booking system can also process cancellations, include a deep-link directly to the booking system in your push notifications. And that is just one way that a mobile app can help you increase the number of tokus making dents in your cushions each day. 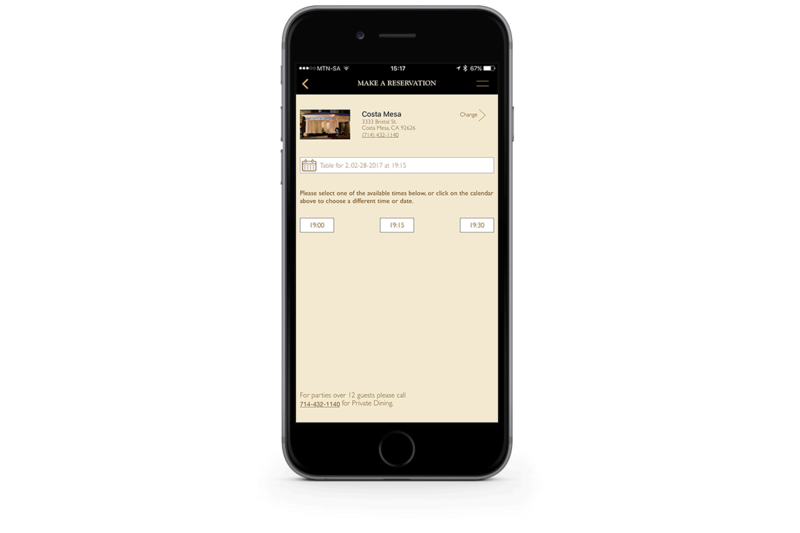 The Capital Grille perfectly demonstrates how even fine dining restaurants can create mobile apps their customers will love using. Making a booking starts with selecting a restaurant – they have multiple locations – followed by a date and time. If your preferred time is not available, the app automatically suggests 2-3 alternative times, thus eliminating the need for a frustrating guessing game. A nice addition is the information at the bottom of the screen pertaining to large parties and private dining. There are a number of ways to incorporate online booking into your app, but if you already accept online bookings via your website, the process should be similar. Using a solution like OpenTable can introduce extra friction by requiring users to register for an additional service, but it also brings with it extra marketing opportunities for your restaurant, while keeping the booking experience familiar across devices. the customer doesn’t need to make space in their wallet or purse for yet another loyalty card. A mobile app for your restaurant eliminates both of these annoyances. Registration can now be done in the app, with you only collecting the information you need; no more than that. And collecting points, or recording visits, is also done in the app, eliminating the need for a card that needs to be swiped, stamped, or punched each time. With a digital loyalty program, you are able to run many loyalty campaigns at once: differentiating between a lunch time visit and an evening meal. You could even use it to incentivise customers who only ever sit at your bar to actually have a meal too. Loyalty programs are one of the top three motivators for customers to spend more, and your own mobile app is the easiest way to offer your customers a loyalty program that is convenient. 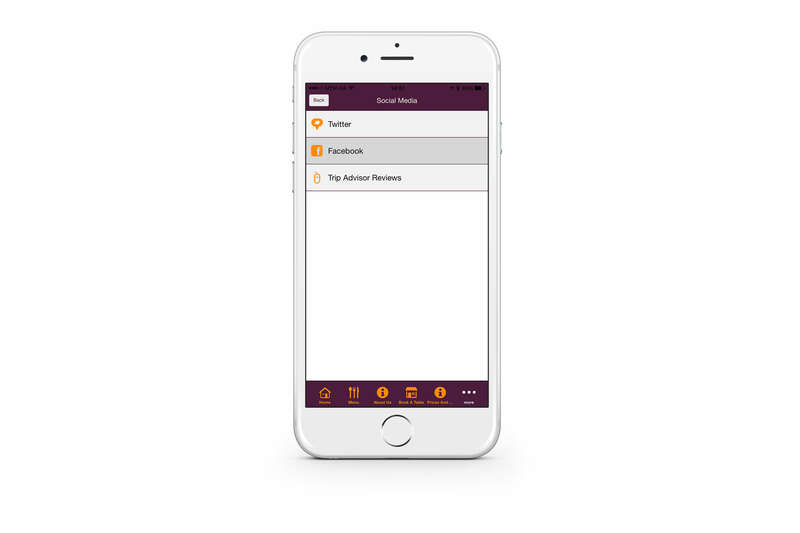 And with a bit of planning, you can even use your loyalty program to help segment your marketing lists, especially when it comes to your push notification strategy. The mobile app for Moe’s Southwest Grill is primarily about loyalty, although the app does include useful features such as the ability to place your order ahead of time – and paying for it through the app. 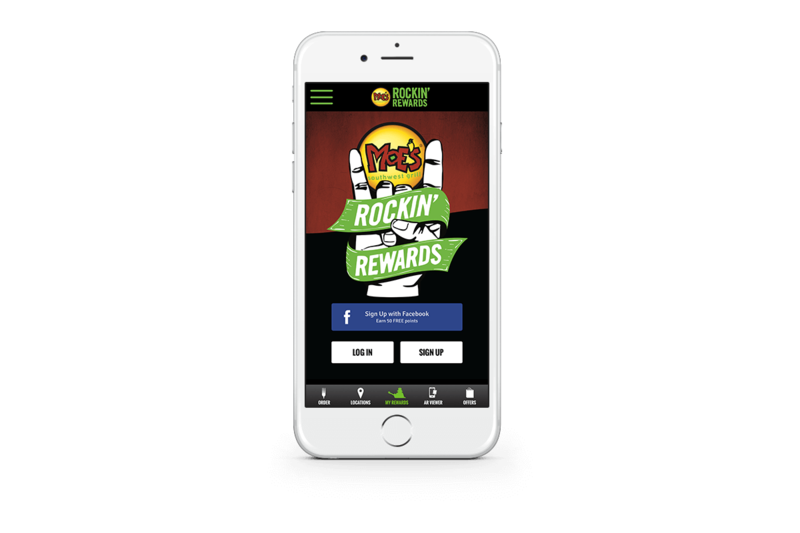 Although you can register for the loyalty program on the Moe’s website, signing up through the app gives you the chance to earn bonus points. And earning rewards is only possible with the use of their mobile app. Your loyalty program could even be structured to drive a specific kind of traffic, such as with wa! Curry who have separate loyalty programs for sit-down and take-out customers. A key part of all marketing strategies is brand awareness, with the goal for many being the achievement of top-of-mind status. But with so many competing brands, and the very large marketing budgets of corporations, neither brand awareness or top-of-mind awareness (TOMA) are easily achieved by small businesses. And for restaurants this is even trickier. Sure you can generate some buzz and coverage through superb service, fabulous food, and dazzling decor, but without something promoting recall, you’re just a nameless restaurant that someone recommended. Having a website, a presence on social media, and using paid marketing all help, but customers need to be exposed to a brand at least 10 times before brand awareness and recall become almost automatic. Of course, having your own mobile app is one of the easiest ways of exposing customers to your brand at least once a day. They might not use your app every day, but as long as they have the app installed, they see your app icon almost every time they use their phone. The icon should be recognisable at different sizes, and against different backgrounds. The colours used, and the design itself, should be consistent with the app, and all other aspects of your brand. 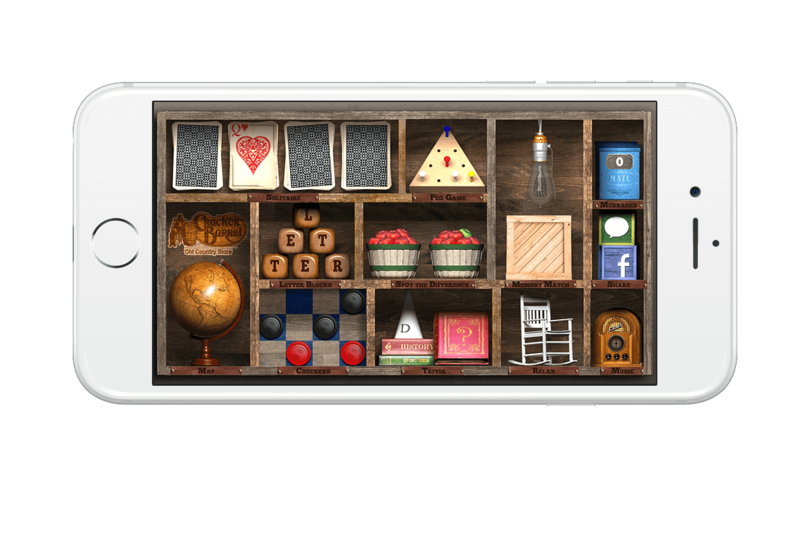 Take a look at apps in the same category – does your app icon standout among all the others? Avoid using words in your app icon since they clutter the design, and can be difficult to read. A restaurant app is not Facebook, so you shouldn’t be hoping for customers to use your app every single day. But you should be wanting them to keep your app installed for as long as possible. 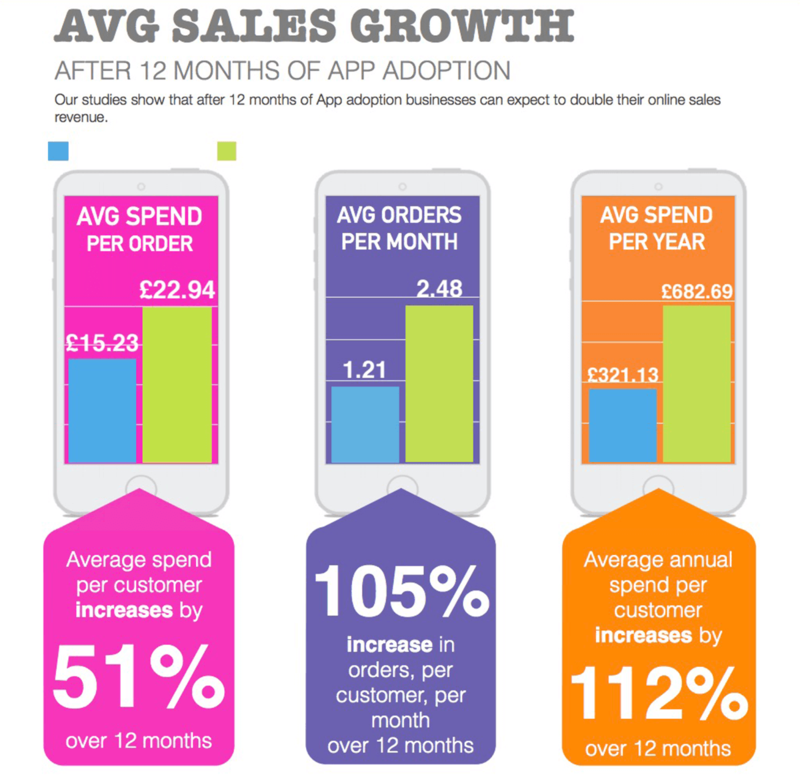 Not deleting your app means that customers find your app valuable and useful, which is great. It also means that they are exposed to your brand for longer, increasing the chances of your attaining top-of-mind status. Compare your app icon to other apps in the Food & Drink category to help you determine how much it stands out, and how identifiable it is. You will notice that there is a lot of red in this category, but that isn’t too much of a concern for chains such as Applebee’s, Noodles & Company, Chipotle, and Chick-fil-A because their icons include their logos, which are already very familiar with their customers. But remember that your app icon isn’t always going to be as large as it appears in the app store, nor will it always be shown against a neutral background. Your trading hours section could now include details of any days on which you won’t be trading. Your booking form could include details of the maximum party size you are able to accommodate. 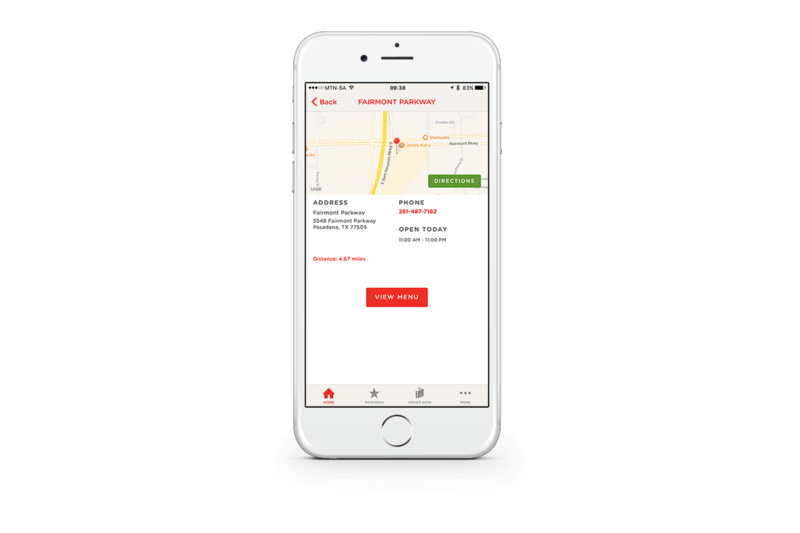 Your address can link to either Apple Maps or Google Maps, providing customers with easy navigation, using a familiar interface. Your contact number can be configured so that customers can call you with a single tap, and without even having to leave the app. If your menu includes options for diners with special dietary needs or food allergies, list these under separate sections, instead of highlighting them within the normal menu. Remember that the menu you give to diners is designed to be efficient and compact, but these limitations don’t apply to a mobile app. The suggestions listed above are based on what we have already seen in some restaurant apps, and you definitely aren’t limited only to implementing these. 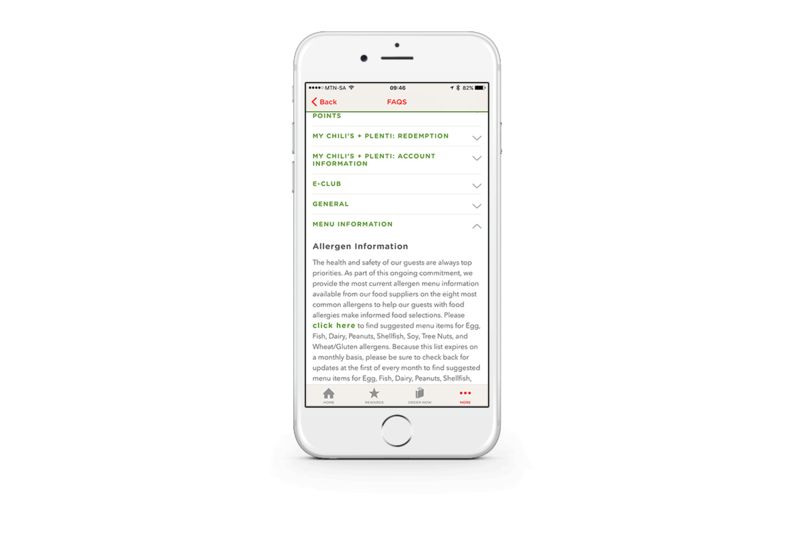 Provide information you are most commonly asked for inside relevant sections of the app, using an FAQ section only as a last resort for any snippets of information that defy classification. The Chili’s mobile app allows you to search for locations using a zip code, city, or state, and once you have selected your favourite location you are presented with a map showing the location, along with full address details, and a clickable telephone number. The same screen also displays trading hours, along with a link to that location’s menu. Tapping on the Directions button in the map will bring up your preferred map app, with turn-by-turn directions from your current location to your chosen restaurant. Although the menu for Chili’s doesn’t specifically separate meals suitable for different dietary needs, the app does include an FAQ section, with a menu information entry. Under this entry is a link to a document with suggested items that don’t include certain allergens. It is not the most elegant solution, but the information is included for anyone taking the time to explore the app. The concept of take-outs or takeaways dates back into antiquity, with street and marketplace food vendors common in Ancient Greece and Rome. Modern restaurants continue to benefit from offering take-outs, and we aren’t talking only McDonald’s and the local fish and chip shop. While not all restaurants offer take-outs, there is nothing wrong with casual and family-style restaurants that do offer take-outs. Except when the order ends up being wrong because you couldn’t understand the person calling the order in. 73% of takeaway owners agreed that phones being engaged at peak times was a significant issue for the business. 63% of consumers questioned on the street had at some point called a takeaway and experienced engaged tones and had not called back. 34% of the time, when calling takeaway businesses during peak times Fridays through Sundays, the phone line was engaged. Bad connections, messed up orders, and asking the callers to repeat themselves can all be relegated to the “remember when” shelf once you have launched your own mobile app. A well thought out mobile app will not only allow customers to book a table electronically, it will also allow them to order a take-out meal electronically. And while using third-party delivery services such as Just Eat, GrubHub, and UberEats fulfil the same function, they can impact on your profit, brand, and overall customer experience. There are a few ways you could incorporate this feature into your app, but always consider user-experience when doing so. When accepting a take-out order, you need to collect some of the customer’s information. You could ask them to submit their name and contact details each time, but wouldn’t it be better to get them to register through your app? That way you collect all the information you need once only, and as long as the customer doesn’t log out of the app, they don’t need to enter their personal information each time they order. This would also simplify the experience of making a booking through your app, and improve your analysis of app usage. As with any registration process, collect only the information you need. Finally, for this to benefit both you and your customers, you need to ensure you have a system in place to manage orders placed via your app. Other factors to consider include notifying customers of the order’s progress, and handling collections and payments. Ordering take-out from Olive Garden is incredibly easy, and you are only asked for standard personal information if you haven’t previously registered with them. During checkout you are also given the opportunity to include any special instructions, request utensils, and apply a coupon code to your order. Payment can either be made through the app, or on collection. Gets rid of the need to check whether an order being collected has already been paid for. The customer service benefits of having a mobile app are not limited only to what the customer can do via the app. Streamlining how customers engage with your restaurant reduces the amount of resources you have to allocate to certain functions. Meaning these resources can be redirected to other areas of the business, benefiting both you and your customers. 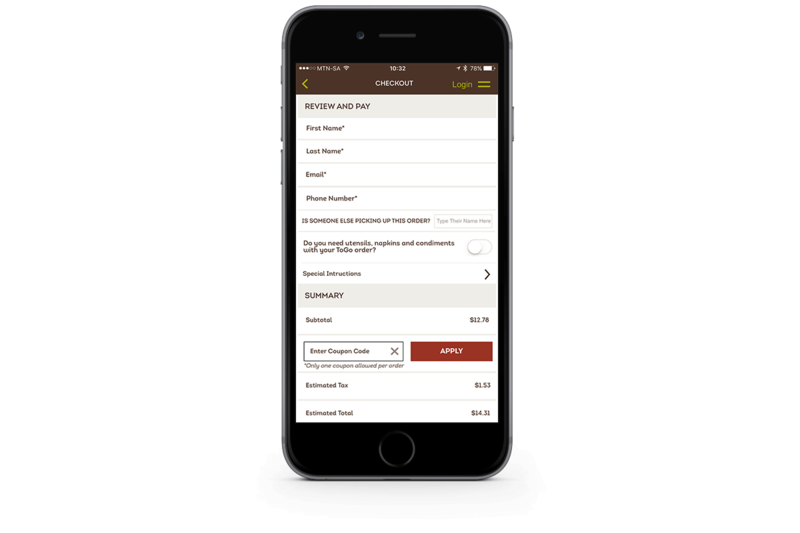 We’ve already seen how Olive Garden handles take-out orders and payments via their mobile app, but Outback’s app is equipped to process payments for sit down meals too, making dining out even more frictionless. There are several payment processing apps that integrate with most restaurant POS systems, but being standalone apps, your customers have to a register for another service; not forgetting that you are faced with additional processing fees. 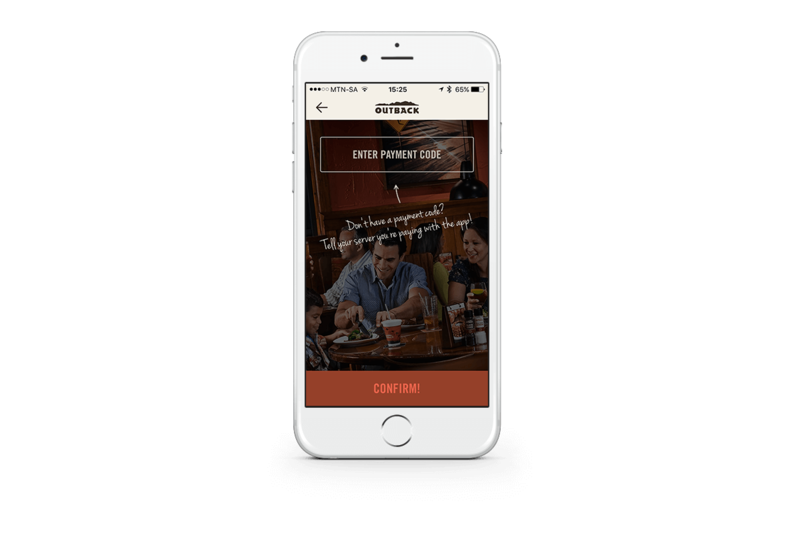 If your POS system makes it possible for you to implement a similar system to that used by Outback you would eliminate some friction, while keeping customers in your own app. and what is more tempting than lush photographs of food? Artful and authentic representations of your food could easily attract more customers than an army of reviewers and word-of-mouth influencers. With an emphasis on authentic! There is an important difference between photographing your famous artisanal ice-cream and photographing a bowl of vegetable shortening. Your website and your mobile app should use professionally styled photographs, but your app can also help establish authenticity. Including a gallery of ‘regular’ photographs in your app will do this. Take time to add new photos to the gallery every time you host a special event, or add new items to your menu. These shouldn’t always be professional photographs – using your mobile phone is quite okay. And the only retouching they should be subjected to is a bit of brightening, and maybe some colour enhancements. Take this a step further by encouraging your customers to send you any photos they take in your restaurant, and of your food. A mobile app is a great platform for including user-generated content (UGC). It requires almost no effort on your part, is pretty much free, and goes a long way to establishing authenticity. This is much easier for casual and family-style restaurants than it is for fine-dining establishments. The latter might want to consider inviting influential Instagrammers to dine for free, in exchange for documenting their meal. While this does need some effort on your part, the benefit is still authentic, lush photographs of your food. wa! 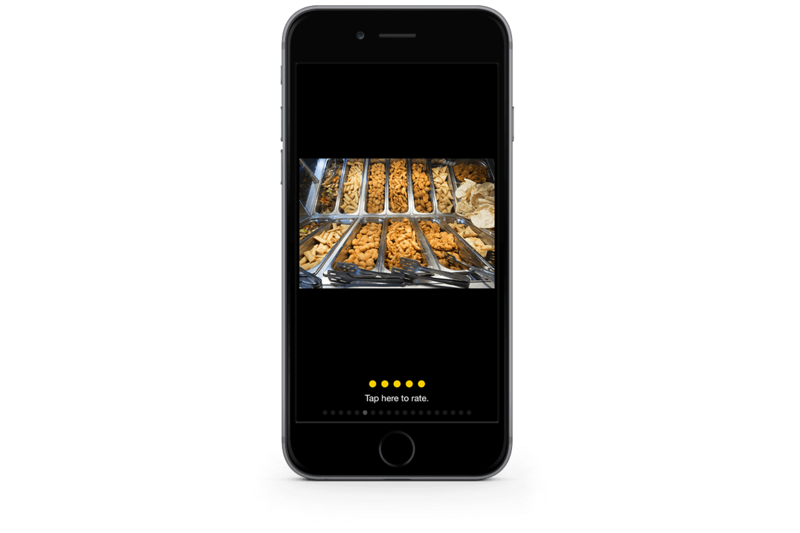 Curry haven’t branched out into including UGC yet when it comes to images of their food and restaurant, but their gallery does invite user engagement by allowing users to rate each image. The images included in their gallery are also not professionally styled photo’s, lending more authenticity to the experience. There are more than a handful of websites and apps for restaurant reviews. But with in-app reviews, you encourage customers to use your app, while making it easier for new customers to find reviews of your restaurant. Remember – the more useful your app, the longer people keep it on their phone, and the more exposure your restaurant gets. If you worry that keeping most of your reviews in your app will limit exposure, you can instead link directly to your restaurant’s page within an external review site/app. This way you are getting exposure outside of the app, but still encouraging customers to use your app to post or read reviews. But why are reviews important? Reviews are not only an opportunity for your customers to document their experience, they should also be seen as strategic brand touchpoints. And what they say, and how you respond to them, can either enhance your brand, or weaken it. And you should be responding to reviews, especially negative reviews. Making reviews accessible through your app not only makes it easier for customer to read and leave reviews, it also makes it somewhat easier for you to manage. But make sure you have a way to respond to reviews in your app. At the same time you should still claim your business with services such as Yelp and TripAdvisor so that you can respond to any reviews posted to them. One way of managing negative reviews is to apologise publicly, and then start a private conversation with the reviewer in which you respond to the points they raised. Negative reviews are not always unwarranted attacks. Mostly they are genuine customer feedback, and they may even highlight issues you were not aware of. The same is true too for positive reviews, which is why you shouldn’t only read and respond to negative reviews. And responding to reviews shows that you read – and value – what your customers say. Chain restaurants tend to skip linking to review sites from inside their apps, but they can afford to. With often more than 100 restaurants per chain, finding a review of your nearest restaurant would be difficult to manage from inside an app. Smaller restaurants, however, would definitely benefit, as demonstrated by wa! Curry, who in addition to linking to their social media accounts, also link to TripAdvisor reviews. An extra, underlying benefit to many of the benefits we have already covered is that of improved customer engagement. There are many ways for you to push customer engagement. But a mobile app makes it possible to bring many of these together. Having what the customer wants. High-quality products – in your case, food. Outstanding service at all times. A friendly environment that makes customers feel welcome and relaxed. A more user-friendly way of doing some things. While you are responsible for taking care of the food quality, service, and restaurant ambience, your app could address user-friendliness. so everything from being able to book a table, through to sharing nutritional information, and easier take-out orders, can make your app and your restaurant more user-friendly by removing friction. Five Guys pushes customer engagement further by making it easy for customers to give feedback from within the app. When selecting Feedback in the app, you are guided through a simple series of one word options to establish the nature of your feedback, before being presented with an email form. Although reviews are a form of feedback, you shouldn’t expect all your customers to be comfortable writing reviews. Simplifying the feedback process is a great option for these customers, and keeping it in-app reduces friction. Of course you need to respond to all feedback, because customer engagement quickly withers when ignored. For all the benefits they bring, push notifications don’t receive nearly as much attention as they should. 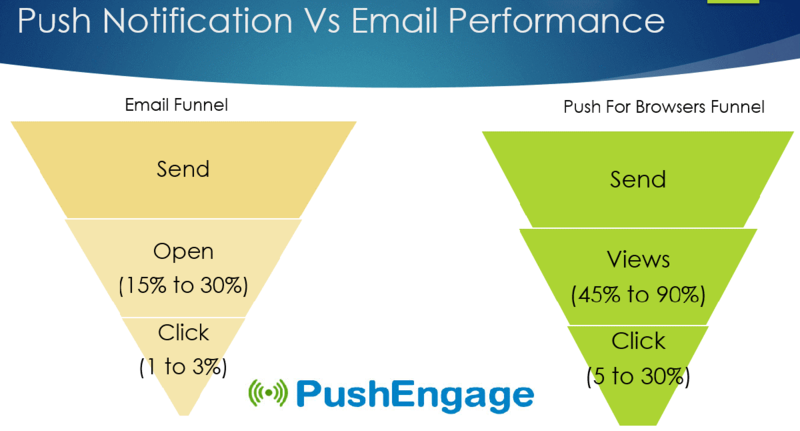 Not only do push notifications have higher view and click-through ratios than email, but they also have a significant impact on app engagement and retention rates. Mobile apps using push notifications have a 26% higher app open rate, along with 92% higher retention rates. However, this depends on you applying the right push notification strategy – ideally no more than one push notification a week, but more than one a month. Sending out too many or too few immediately reduces any of the benefits outlined above. They are, by nature, short and can be digested more easily than an email message. Like email marketing, push notifications are permission based marketing, so when someone opts-in to receiving push notifications, you already know that they have an interest in your business. Most marketing depends on you being able to deliver the right message to the right audience in the right place, and at the right time. But with push notifications you only need to focus on the message, the place and the time. And by adding geolocation targeting to your push notification strategy, you are able to take care of the place by ensuring that highly focused notifications are only sent to users when they are geographically close to your restaurant. So instead of sending out details of a lunchtime special to all your users, you could send it only to users who pass within 100-200 meters of your restaurant between 11am and 2pm. Most digital marketing efforts have a medium to high cost attached to them, but push notifications are low-to-no-cost. Aside from the time needed to create the notifications, and maybe a bit of time to segment your lists and create geo-targeting rules, the actual cost is minimal. Read that paragraph again. And then read the preceding point again. Who wouldn’t want to benefit from marketing that has minimal costs, but engagement and open rates that far exceed other forms of digital marketing? And as outlined out in the preceding point, you are also marketing to people who already have an interest in your business. Although the preferred response to any push notification campaign would be customers supporting your restaurant when they hadn’t originally planned to, any customer action aside from them deleting your app is still a win for you. After all, brand awareness is still a benefit if the cost associated with it is negligible. 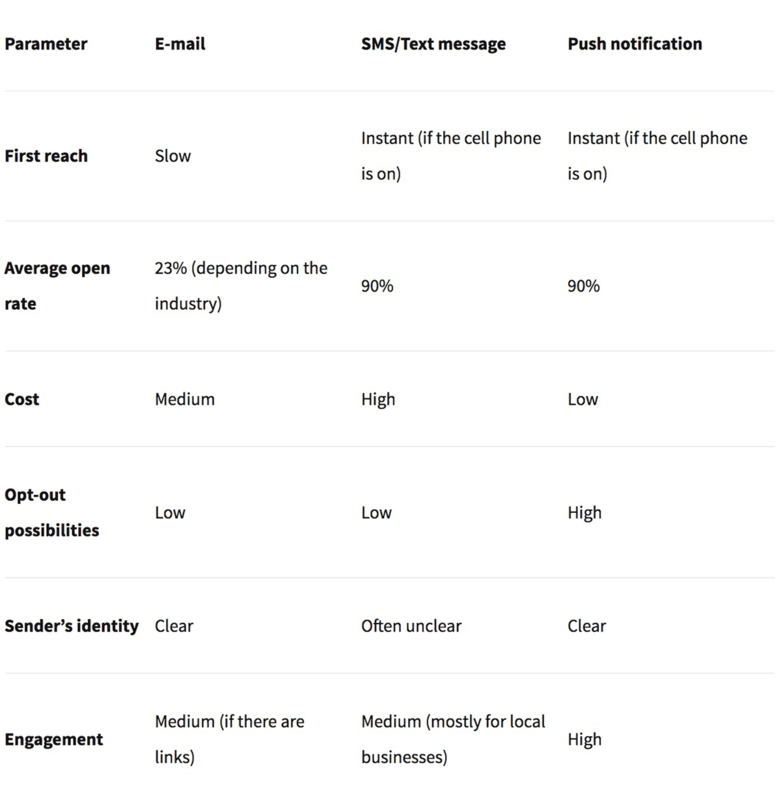 As hinted at earlier, setting up geo-targeting rules and carefully segmenting your list of users are important factors to consider when implementing a push notification strategy. Personalisation is a growing trend in marketing, and response rates for push notifications are themselves higher when the message is somewhat personalised. This doesn’t mean addressing each user by name, but rather that messages should be relevant to each user. A lunchtime special is more relevant to a user who is a few hundred metres from your restaurant than one who is a few miles away. Similarly, new additions to your wine list would appeal more to customers who frequently order wine when dining in your restaurant than those who never order wine. Most of the app examples included in this article have been for chain restaurants. As is the case with many new marketing tools, larger businesses are usually the first to implement them. But with app building platforms making development easier and more affordable, small businesses and restaurants can no longer ignore the benefits of having a mobile app. Launching your own mobile app ahead of your local competitors can give your restaurant a valuable boost – both in terms of visibility, and business. Being part of the first wave will allow you to be more noticeable when you market your app, and the features and benefits it offers to customers. At the same time, those features and benefits will be more appealing to new customers when you are the only restaurant offering them. And as long as your food, ambiance, and service are just as great as the features in your mobile app, these new customers could turn into long-term customers. Remember, you want to stand out for all the right reasons. And as Cracker Barrel shows with their app, standing out doesn’t always depend on you having all of the above features in your app. Cracker Barrel is known for a style that mimics old-fashioned homely charm, with board games on each table, and country music in the background. Their app includes some traditional digital games, music, and the ability to find your nearest restaurant, nothing more. You could launch your app with only one feature – as long as it is perfectly implemented, and offers both you and your customers immediate benefits – and then add more features as necessary, and only when they are ready. Having a website doesn’t mean you don’t also need a mobile app. As consumers switch to using mobile devices more than desktops, your own approach to digital marketing needs to evolve. And your website remains an important tool for discovery, with your mobile app serving as a way to market more effectively to customers with a known interest in your restaurant. Growing your restaurant isn’t only about attracting new customers, but also about increasing support from your existing customers. And as shown in this article, a mobile app offers you and your customers more benefits than only a website.